The Collinsville City Commission met Monday May 5th (at the City Hall Community Room, 106 N 12th Street) for a 7pm regular of the Municipal Authority & City Commission. 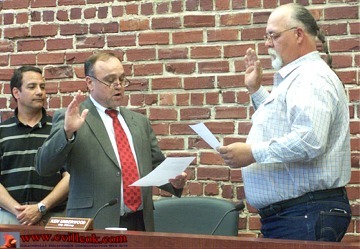 With Mayor sallee looking on, City Attorney Ken Underwood led new City Commissioner Bud York through the oath of office Monday. York was elected March 4, 2008 winning over incumbent Trent Rogers. A. Approval of minutes of April 21, 2008 regular meeting. Crowder Disaster Recovery started the city park cleanup of ice storm damaged trees last week. The first residentail right-of-way pickup pass is occuring in the north side of the city and may complete by Thursday (May 8th). The first pass in the south side of town would then begin. Rep. Earl Sears has mentioned a possibility of receiving a cutting from the OKC survivor tree for planting in Collinsville. Two city employees attended a customer service seminar. 34 new city home permits issued between Jan. 1 - April 24. POSTED 5/1/2008 at 4:00 p.m. by Angela Long, City Clerk. 4. CONSENT: All items listed under the Consent Agenda are deemed to be routine in nature by the governing body and will be approved by one motion of the governing body. Items on the consent agenda will not be discussed. Any member desiring to discuss an item may request that it be removed from the Consent Agenda and placed on the regular agenda. 6. Update from Jerry Lawson regarding Main Street Enhancement Project. -- Removed most of initial concrete pours which failed to meet the ODOT specs (grade and air content). The extra cost will be absorbed by the contractor (not the city). August 10th is the final completion date before $600/day penalties begin. 8. CSP-64 - discussion and possible action on Site Plan - Applicant Kyle Smalygo, Smalygo Properties wishes to address the Board of City Commissioners relating to certain elements of the required Site Plan for an industrial building proposed on 1.97 acres at the NE/C of 156th St. N. and the SKO RR. The Planning Commission is transmitting this item from April 17, 2008 Regular Meeting with no recommendation at the request of the applicant. -- This topic was not discussed. with Pam Polk indicating the City Attorney ruled the Planning Commission must make a recommendation before the action could be brought to the City Commission. 11. PUBLIC HEARING - CZ-170/Ordinance 809 - Zoning Text Amendment - Hearing and discussion and possible action of Ordinance 809 - Building Appearance Standards/Permitted Yard Obstructions. -- tabled for further review by the commission. Construction of new ribbed metal buildings is currently under moritorium in Collinsville pending this new set of codes with specific recommendation for preferred materials for "surface harmony" which will be "objective and defendable" and not just subjective. --per City Planner Bob Wolfram. The planning commission had already approved the new wording. 16. Discussion and possible action considering the request for emergency funding for creek clean up from National Resources Conservation Service, a division of USDA. -- approved, the city will apply for a federal grant (requiring US Congressional approval which might be a lengthy process) for the $400,000 estimated cost of clearing the ice storm damage debris from local creeks. The city would be required to match 25% of the grant amount but it would likely be in-kind city labor. (The current Crowder cleanup will help with the creek through the park and some areas adjacent to city right-of-ways ... but still leave many creeks uncovered). 17. Discussion and possible action to declare 1971 Ford Boardman Fire Truck, vehicle identification number C75FVL11492, surplus and donate to the Oklahoma State Fire Fighter's Museum. -- The surplus status for the old truck was approved, but the city can not legally made a direct donation. The normal disposal of surplused items will be followed. The OKC museum indicated the names of fightfighters lost in the Sept. 11, 2001 NY attack would be part of the display of the truck if they received it. 18. Discussion and possible action to authorize City Manager to sign amendment to the Metropolitan Environmental Trust indenture. 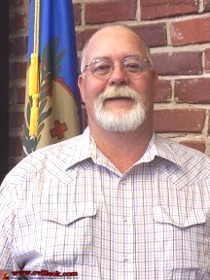 -- approved, the modification is the joining of the trust by the City of Coweta. 19. Discussion and possible action to approve PWP annual contract for fiscal year 2008-2009. -- approved, the Prisoner Work Program has been a "great program" for Collinsville (per Pam Polk & Stan Salllee) and provided 8-10 workers per day for the past two years for about $650/month.